Fairfield's #1 Maura Keary misses a Trumbull hit, during little league softball championship action at Unity Park in Trumbull, Conn. on Tuesday July 2, 2013. Trumbull went on to beat Fairfield 8-7. Trumbull Little League softball coach George Ameer watched helplessly as his team's five-run lead, and season, was fading away in a barrage of fourth-inning Fairfield hits. Yet, there was still some fight left in Ameer's group. Down to its final six outs, Trumbull rallied for two fifth-inning runs and claimed the District 2 championship, unseating Fairfield 8-7 Tuesday afternoon at Unity Park in Trumbull. "We've hit them 1,000 ground balls, 1,000 pops, but what we can't teach them is to have some heart and some courage," Ameer said. Haley Komoroski pitched 2 1/3 scoreless innings -- striking out five of the seven batters she faced, including one with the tying run on second to end the game -- to earn the win. "I was so impressed with Haley to come in and actually take care of that," Ameer said. "That was an amazing thing for her to do." Trumbull advances to the Section 1 tournament and will play Seymour in its sectional opener Friday, July 5, at 8 p.m. at the Old Tavern Road Complex in Orange. Fairfield (2-3), which had won the previous two New England regional championships, fell to Trumbull for the third time this year. "We had a great run," Fairfield coach Tim Boyle said. "We had a lot of heart." After building a 3-1 fourth-inning lead, Trumbull tacked on three fourth-inning runs, when Fairfield was burned by Trumbull catcher Courtney Fairfield. Trumbull's catcher drove in two of her three runs with a fourth-inning RBI double that made it 6-1. Still, even with a five-run lead, Ameer was concerned. "With (Fairfield), I never feel confident," Ameer said. "Definitely not comfortable with a five-run lead." And Fairfield proved Ameer's fears right as its first five batters reached in the fourth inning -- four via singles -- that cut Trumbull's edge to 6-4. Sara Fagan's RBI groundout was the inning's first out, and Kaleigh Boyle's infield single tied the game. "I felt so helpless," Ameer said. "It was unnerving. I just felt helpless, and I felt that there was something I should be doing." Two batters later, Amanda Schramm blooped a two-out RBI single that gave Fairfield a 7-6 lead. "They were just getting the bat on the ball," Boyle said. "They figured it out; it was good to see." After Trumbull's first two reached in the fifth, Fairfield pitcher Abrianna Natoli struck out the next two. With two outs, Tiffany Dio's RBI single tied the score at 7-7. After Becca Lubbert walked, Natoli uncorked a wild pitch that enabled Komoroski to score and give Trumbull an 8-7 lead. "For them to respond so quickly with two runs in the next inning, I'm so pleased with them," Ameer said. "It's unbelievable." Trumbull built its initial advantage from the start, scoring two runs in the first inning. Fairfield's RBI double scored Kayla Giacobbe, then Krystina Schueler drove her home, making it 2-0. Fairfield scored one in the first when Schramm drove in Natoli with an RBI single. 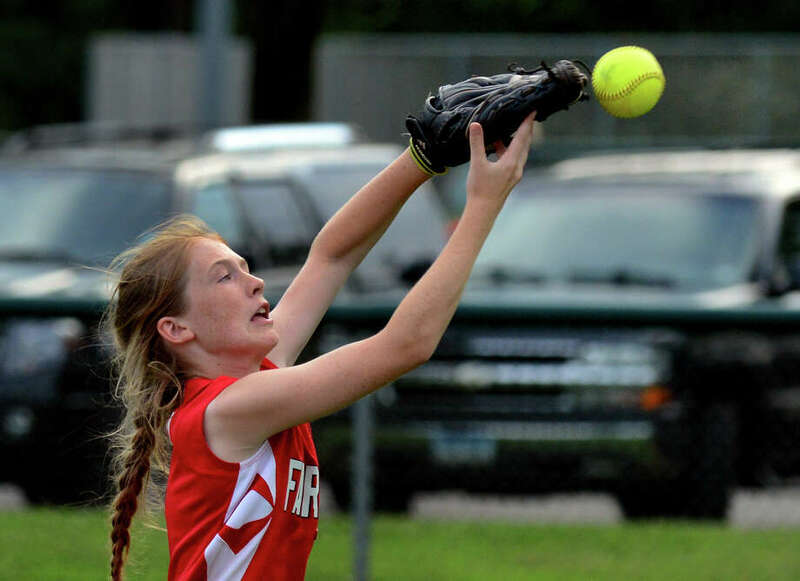 But Fairfield was kept from scoring any more when Schueler robbed Amanda Pettizzi with a diving catch that saved a run. Records: Trumbull 5-0; Fairfield 2-3; Batteries: T--Tiffany Dio, Haley Komoroski (W) and Courtney Fairfield; F--Kaleigh Boyle, Abrianna Natoli (L) and Katie Goodchild.